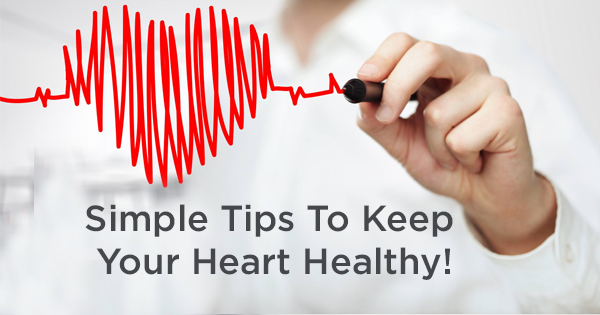 Simple Tips To Keep Your Heart Healthy! Today’s desk jobs, sedentary lifestyle and workplace pressures escalate stress levels, taking a toll on one’s heart. Not only old people, but youngsters are also prone to these heart diseases. Here we bring some simple tips to make your heart happier & healthier! Quit Smoking – This has to be the first step towards a healthier heart! The risk of heart disease reduces by 50 percent, as soon as one quits smoking. WHO also reports that the risk of coronary heart disease in non-smokers is about half that of a smoker’s. So, before you pick that next cigarette, remind yourself of all the health risks associated with it. It’s high time you take your health seriously! Watch your weight – Being overweight can double your risk of heart diseases. So, get up, move a little – take stairs instead of lifts, stick to a healthy, balanced diet and be physically active. Don’t lose those extra kilos for anyone but you; your heart will thank you later! Don’t sit for too long – Sitting for long hours at one place can increase your risk of various diseases, including heart ailments. Even if your job involves sitting all day, don’t forget to get up and go for a walk every hour. Get enough sleep – No matter what your age is, getting enough sleep is the key to keep your heart healthy! 7-8 hours of sleep is imperative to keep all cardiovascular diseases at bay! Look after your mental health – Depression is not taken seriously in our country, but the truth is that people with depression have a higher chance of heart diseases. Therefore, look after your mental health, if you feel stressed, talk to your family/friends. Don’t let depression become a threat to your health. Take care of yourself and let your heart be happy! Posted on June 29, 2017 Categories General HealthTags exercise, fitness, Health, healthcare, healthy, heart, Heart Health, medical, medicine, physical activityLeave a comment on Simple Tips To Keep Your Heart Healthy!